Testosterone Cypionate is an injectable long-acting sustained release testosterone preparation dissolved in oil that can be found mainly on the US market. In the US, testosterone cypionate is the most widely prescribed in the medical field of injectable testosterone preparation, whereas in Europe, there are relatively few drugs with this drug, such as the Spanish testex of Q-pharma. Basically, testosterone cypionate and testosterone enanthate are more or less interchangeable because of their very similar properties and half-lives. 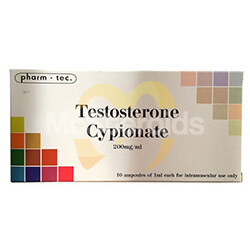 In the medical field, testosterone cypionate is primarily used as part of a testosterone replacement therapy in men who suffer from testicular hypofunction. Structurally, testosterone cypionate is a testosterone molecule to which a cypionate ester at position 17 was attached by means of a beta-17 esterification. In terms of time of action and release curve, testosterone cypionate and testosterone enanthate behave almost identically, which is not surprising considering that the cypionate ester and the enantate ester are only one carbon atom in number of carbon atoms. Because the cypionate ester contains one more carbon atom than the enantate ester, 100 mg of cypionate contains minimal testosterone, but the difference to testosterone enanthate is so minimal that the user will not notice the difference in practice. There are anecdotal reports from users who believe that testosterone cypionate gives a slightly stronger “kick” than testosterone enanthate. Dan Duchaine also mentioned this phenomenon in his Underground Steroid Handbook. Furthermore, some users believe that the use of cypionate causes more water retention than comparable levels of testosterone enanthate. For both statements, however, there is no scientific basis, since free testosterone is the actual active ingredient in both drugs and the release patterns of testosterone are almost identical in both testosterone esters. One to two days after the injection of testosterone cyp, the testosterone blood levels reach their highest value and then gradually fall back to baseline over a period of 12 days. Even if testosterone levels drop sharply about 5 days after administration, they are still markedly elevated after one week (2). Since testosterone cypionate, like all long-acting testosterone esters, causes rather pronounced water retention depending on the dosage, it can be observed in practice that cypionate is mainly used in the framework of mass building. 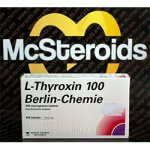 In this regard, it is often observed that testosterone cypionate is combined with all other common steroids. 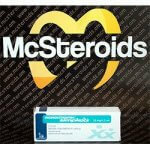 In practice, a combination with oral steroids such as methandrostenolone (Dianabol) and oxymetholone (Anadrol) as well as injectable steroids such as nandrolone (Deca Durabolin), boldenone and trenbolone are the most commonly observed. 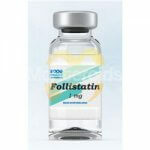 In the medical field, the dosage used for the purpose of testosterone substitution in a testicular hypofunction between 50 and 400 mg testosterone cypionate every 2 to 4 weeks (1), whereas in the field of bodybuilding average weekly dosages of 250 to 1000 mg testosterone cypionate can be observed Injections usually take place at intervals of 5 to 7 days.